Explanation: The New Moon's dark shadow crossed planet Earth on September 1. In silhouette the Moon didn't quite cover the Sun though, creating an an annular solar eclipse. The shadow's narrow central path was about 100 kilometres wide at maximum eclipse. Beginning in the South Atlantic, it tracked toward the east across Africa, ending in the Indian Ocean. Waiting on the Indian Ocean's Reunion Island, eclipse watchers enjoyed a view just north of the eclipse centreline, the annular phase lasting a few minutes or less. 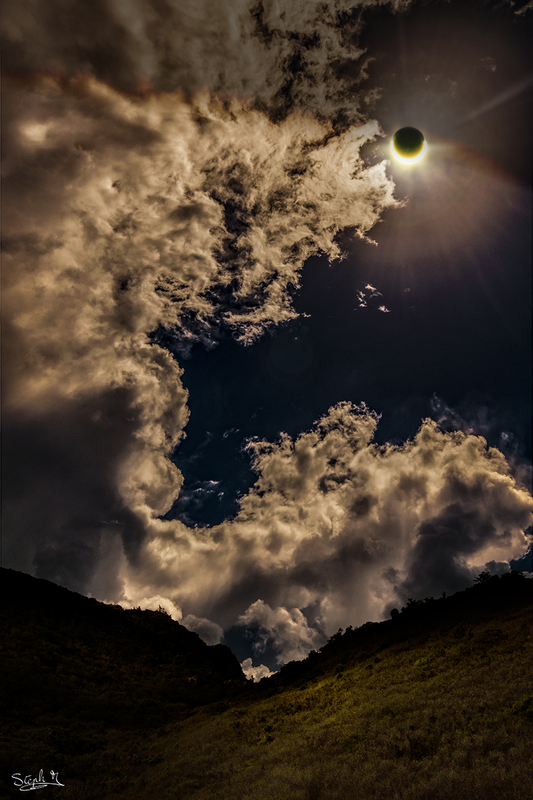 Clouds threaten the nearly eclipsed Sun but create a dramatic sky in this wide-angle and telephoto composite at a partial phase from the northern side of the 50 kilometre wide island.